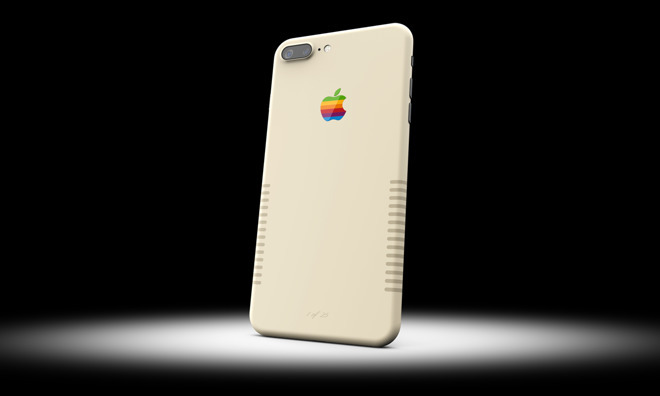 Nostalgic Apple fans with deep pockets can now purchase a custom-painted iPhone 7 Plus "Retro Edition" from ColorWare, designed to look like a vintage Macintosh computer from the 1980s, for a princely sum of $1,899. The handset is an unlocked, SIM-free iPhone 7 Plus with 256 gigabytes of storage. ColorWare is purchasing off-the-shelf black models and giving them a custom paint job— for an extra $930 over the sticker price. ColorWare says the paint job is available for a limited time only, and the first 25 purchases will include their own number of authenticity. "Great attention to detail is given to this fully painted iPhone," the official description reads. 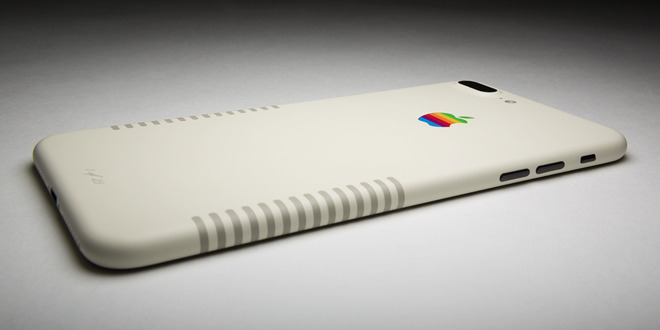 "With the multicolored Apple rainbow logo and the dark beige edge stripes your iPhone will be a work of art." The new option comes just a few weeks after ColorWare began offering Apple's AirPods in a selection of 58 colors for a $130 premium over the $159 standard price. Unlike the AirPods paint job, which sticks to a solid color, the iPhone 7 Plus Retro Edition boasts colors and patterns, including a rainbow Apple logo, beige body, and dark Macintosh-like stripes down the sides. ColorWare says its new premium-priced paint job will ship in about 2 to 3 weeks. Purchases include a 12-month warranty against defects, and shipping is available internationally.